Peters Burton, E., Frazier, W., Annetta, L., Lamb, R., Cheng, R. & Chmiel, M. (2011). Modeling Augmented Reality Games with Preservice Elementary and Secondary Science Teachers. 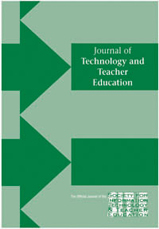 Journal of Technology and Teacher Education, 19 (3), 303-329. Waynesville, NC USA: Society for Information Technology & Teacher Education. Retrieved April 25, 2019 from https://www.learntechlib.org/primary/p/37136/.